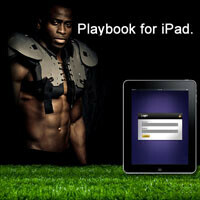 Global Apptitude is the Maryland-based software company behind the Baltimore Raven’s switch to playbooks on iPads. Its Digital Playbook Technology enabled the team to ditch the classic three ring binders for a lightweight tablet that had access to all the information a player could ever need. Fusee went on to explain that the reason Global Apptitude’s products are so successful is that NFL coaches and administrators, not software engineers, design them. The current NFL rules prohibit any device that can record or play video or “any type of computer” to be used during pregame preparations or the game itself, so you won’t see hordes of iPads on the sidelines anytime soon, but it does seem that moving forward, tablets will play a bigger part behind the scenes. i love the idea. so much easier to use and since we're in the technology age, it was bound to happen...GO RAVENS!!!!! Stupid rule...well not about cameras ....wait there are TV cameras on the sidelines? Yeah stupid rule.